FOOTBALL IS ONCE AGAIN showing that it lives outside accepted business behaviour as Jose Mourinho’s reign at Chelsea continues to unravel. It seems it is only a matter of time before the “troubled one” makes his exit from Chelsea, project unfulfilled and reputation damaged. It is hard to understand just what has gone wrong at Chelsea, but all fingers are now pointing at Mourinho and his antics over the past few months. It really is Mourinho contra mundum, with small fires breaking out all over the Stamford Bridge campus. 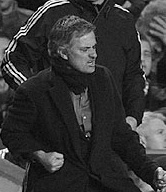 It does appear that Mourinho has accepted the inevitable, that he will be leaving the club he loves. Does he still have that enormous affection, though? Since the start of the season, he seems to be at odds with Chelsea, starting with his stance on Petr Cech and the name infamous “Eva-gate” incident with the club doctor. A red card here, a fine there, Mourinho has scarcely been out of the news. And, as his very visible and well documented pain has unfolded, nobody has any sympathy. It does look likely that divorce is coming. If the reports are to be believed, Chelsea have been casting their eyes towards Guardiola and Simeone, while Mourinho has been sounding out his next move. Paris St. Germain and Inter are both on that list. Laurent Blanc’s future will depend on PSG’s Champions League campaign, because they will surely win Ligue 1 once more. As for Inter, Roberto Mancini will be expected to deliver the Scudetto in a Serie A season that looks wide open. Anyone watching the drama from afar may think twice about Mourinho. His credibility, even among Chelsea fans, has eroded these past few months, and his second career at the club has confirmed what many people believed – that there is a pattern . If you want a two-year burst of success, probably a pot or two, then he’s your man. After two years, start succession planning. Perhaps this is how people should view him – a man for a short-term job rather than dynastic transformation. What happens, then, when Mourinho does go, either of his own free will or after a visit to Cobham of the Chelsea top drawer? It will be the end of the affair. When he left the club in 2007, Chelsea fans were in shock, it was quite hard to take. For the next six years, the club went through a number of big name managers, but deep down, Chelsea fans knew that Mourinho would return one day. It was football’s version of Burton and Taylor. If he goes, the dream is definitely over. Even though the most ardent Chelsea fan knows that something is badly wrong in the Roman empire and many realise there may be only one solution. It will be one of those “Beatles break-up” moments. This time, there will be no going back.